Snug Fitting: Gloves are of no use, if they easily come off during a bump or spill. They need to fit snug without feeling too tight or too loose. Two adjustable Velcro straps at the wrist make these gloves tightly secure and also an easy on easy off one. Double Layer of Stitching for Durability: double stitching for seams makes the gloves durable and gives an assurance that the glove lining is going to stay intact over a long period of time. Large Gauntlet Cuff: The Gauntlet cuffs extend a few inches above your wrist and make sure your hands are covered at all times to keep the cold air from going up your sleeves during wretched winters. Knuckle Protection: The knuckle carbon fiber protection comes as a lifesaver, as it guards the knuckles against the impact of a crash during an unforeseen accident when your knuckles end up punching the ground. Soft Fleece for improved Dexterity: Soft brushed fleece interior lining makes the gloves feel like a “second skin” and enable you to move your hands and reach all bike controls, pockets, zippers etc. without any restriction. Palm Cushions for Shock Absorption: Even a minor skid or a stumble can give you a shock that travels right from the palm to your arms and then your shoulders and the back. 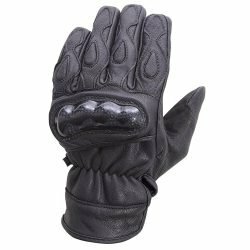 The cushioning on the palm of these gloves makes them resistant against abrasions and absorbs the shock from the road thereby protecting the rider from aches and injuries. Needless to say, the Wicked Stock gloves have been rated with five stars by most of our esteemed customers.